For over a year we have been documenting outright censorship of conservative opinion by Google, via their search engine ranking system, their video platform YouTube by making whole channels and content disappear on restricted mode, while demonetizing video commentary that doesn't conform with their "flaggers" ideological opinions, specifically demonetizing conservative content by labeling it "extremist," along with outright censorship on social media platforms, like Facebook and Twitter, once denied but admissions caught on hidden camera, along with whistleblowers exposing them, prove those denials false. 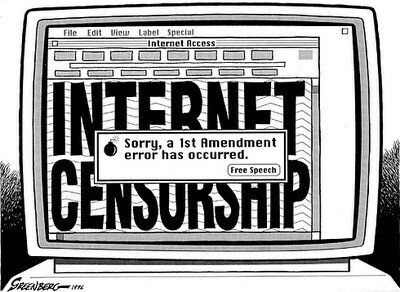 Another form of censorship has been occurring for a few years, where more and more liberal websites, and liberal MSM online sites have shuttered their comment section. Back in 2015, Breitbart highlighted this attack against opposing opinions, by shutting down the comment sections on dozens of liberal websites and news sites, to where they claim the reason for refusing to allow readers to weigh in and hold active discussions real-time, was "abuse" and "harassment." In the years since then, others have followed suit, with the most recent being announced last week by The Atlantic, in a post that appeared to be just announcing the creation of a "new Letters section," saying they will "feature the smartest, most compelling responses to our journalism." In other words, they don't want an open discussion, they want to be able to decide exactly what their readers get to see as reader feedback by censoring them and picking and choosing what they consider to be the "smartest, most compelling responses to their journalism." As to racism, sure their are people that online that leave racists comments, but we have also seen liberals, like those that run The Atlantic, scream racism against anyone that highlights high crime rates in certain cities, anyone that voted or supported Donald Trump. They howl "homophobia" against anyone that disagrees with them on LGBT issues, or anyone that is religious. If you think America is entitled to vet people coming from countries where there are high levels of terrorism, they call you "anti-Muslim." You get the point..... this isn't about "elevating respectful, intelligent discourse and argument," it is about silencing anyone that disagrees with their political and ideological stance. As one of the moderators here at ANP, we are familiar with trolls, and those that come for no other reason but to "hijack" a thread and attack, but we can also say with certainty that not all that disagree, debate or criticize, are trolls, and they do not make the conversation "unhelpful" or "destructive," but do just the opposite, offer an open discussion so that observers can see multiple sides of an issue. Simple commenting guidelines such as "be civil," when enforced, are more than sufficient to leave open and free discussions on a website. Someone starts personally attacking others, they get a warning that they are free to disagree, debate, criticize, and discuss, but to do so in a civil manner, and if they do so, then their opinion is welcome, whether we agree with it or not. What The Atlantic, and other liberal websites that have shut down any meaningful discussion on their site are doing is no different than those little snowflakes on college campuses that need a safe space because they cannot handle hearing opinions other than their own. They can't have anyone with an opposing ideological or political viewpoint offering another perspective on their website (safe space), so they are silencing them and deciding what opinions are "worthy" to be shown on their new "Letters" section. In other words, they don't want their readers exposed to differing opinions. 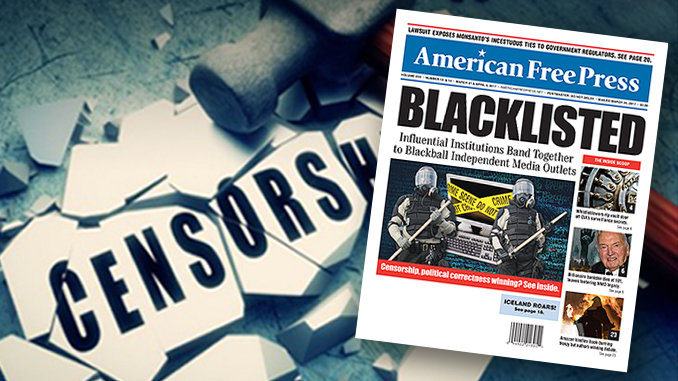 Independent Media is being censored and attacked from a number of directions, with big tech attempting to bankrupt sites that do not conform to the liberal MSM narrative, but the issues is much bigger than just Independent Media websites. These attacks are also being perpetrated on the readers, those holding different views and wanting to have a discussion or debate being shut down by closing off comment sections, all as part of the attempt to silence anyone that isn't pushing liberal propaganda. Just as liberal snowflakes on college campuses want to only hear what they agree with, these liberal websites and MSM online sites only want their "spin" to be seen by their readers, so they shut down the commenting systems. They don't just want to stay in their own "safe space," they also want force those with opposing opinions to be locked away into their own "space" as well by cutting off access to anyone that might observe a debate and find "Hey, I agree with that [opposing] opinion." They are doing this under the guise of "protecting" their readers from what they define as "racism," or "homophobia" or "anti-Muslim," or anti-immigrant," commentary. 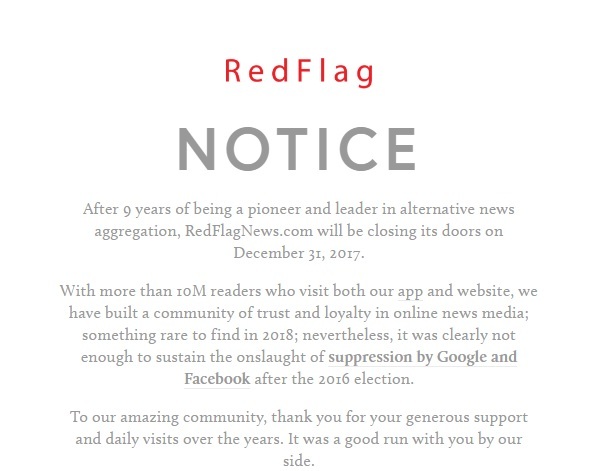 These are multi-pronged attacks by online liberals and social media giants and Google, YouTube, etc..... try to bankrupt Independent Media, as evidenced by the recent shuttering of Red Flag News, and Right Wing News, then prevent people that read Independent News from expressing their opinions elsewhere online. This war against Independent Media was the topic of a censorship conference in DC on February 6, 2018, where panelists including Jim Hoft of the Gateway Pundit, Margaret Howell of Right Side Broadcasting, and anti-Islamization activist Pamela Geller, with a video presentation by conservative commentator and writer Michelle Malkin, where they discussed the online censorship of the conservative and Independent voice, calling for our lawmakers to stand up against this attack on Independent Media, with Hoft stating "If they don’t we’re going to be squashed out of existence." Pamela Geller argued that the election of Trump “escalated the war for free speech,” adding that the establishment and the left “blamed” social media platforms for allowing right-wing ideas to spread. Geller called on the government to ensure the neutrality of web platforms. 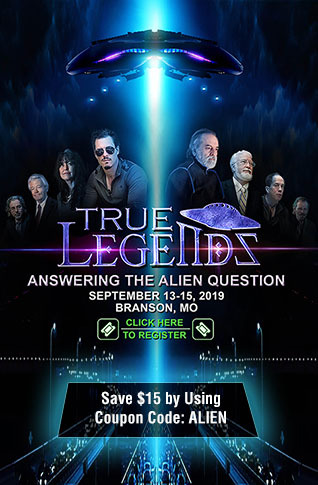 It is no coincidence that sites like The Daily Caller, Daily Signal, Government Slaves, True Pundit, Campus Reform All News PipeLine have been forced to add donation pages or other options, after the 2016 election, when big tech, the MSM, and social media giants realized they could no longer control the masses, so instead they have begun attempting to destroy anyone not in ideological alignment with them, while shutting down open dialogue on the liberal sites, so that readers that want news without the liberal spin from the MSM and liberal websites, have no place left to express their opinion online. This is not just a war on Independent Media, this is a war on every single person that no longer trusts the MSM.